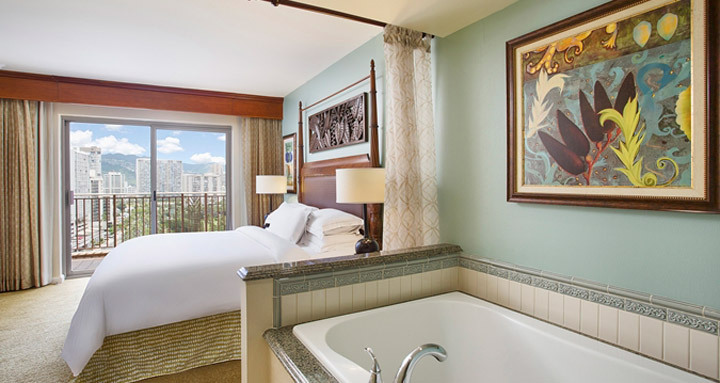 The Grand Waikikian Suites by Hilton Grand Vacations offers a romantic location in the oceanfront paradise of Waikiki. Stay in a one- or two-bedroom suite and enjoy spacious living and dining with a fully equipped kitchen and balcony. Savor a quiet night in with a meal and movie or invite friends around for drinks on the balcony. All suites feature modern amenities including flat-screen televisions, a microwave, wet bar and washer/dryer.